The pungency of mustard oil is due to the presence of allyl isothiocyanate, an activator of the TRPA1 channel. This oil has a distinctive pungent taste, characteristic of all plants in the mustard (Brassicaceae) family (for example, cabbage, cauliflower, turnip, radish, horseradish or wasabi). 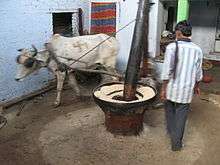 It is often used for cooking in North India, Eastern India, Nepal, Bangladesh and Pakistan. In Bengal, Orissa, Assam and Nepal, it is the traditionally preferred oil for cooking. The oil makes up about 30% of the mustard seeds. It can be produced from black mustard (Brassica nigra), brown Indian mustard (B. juncea), and white mustard (B. hirta). The characteristic pungent flavour of mustard oil is due to allyl isothiocyanate. Mustard oil has about 60% monounsaturated fatty acids (42% erucic acid and 12% oleic acid); it has about 21% polyunsaturated fats (6% the omega-3 alpha-linolenic acid and 15% the omega-6 linoleic acid), and it has about 12% saturated fats. Based on studies done on laboratory animals in the early 1970s, erucic acid appears to have toxic effects on the heart at high enough doses. While no negative health effects of any exposure to erucic acid have been documented in humans, publication of those studies led to governments worldwide moving away from oils with high levels of erucic acid, and tolerance levels for human exposure to erucic acid have been established based on the animal studies. Mustard oil is not allowed to be imported or sold in the U.S. for use in cooking, due to its high erucic acid content. Including oils in the diet that are high in alpha-linolenic acid has been thought to protect the heart and to prevent cardiovascular disease, but recent reviews have cast doubt on this, finding only slightly positive outcomes or even negative outcomes. Two studies on health effects of mustard oil have been conducted in India, which had conflicting results. One found that mustard oil had no protective effect on the heart, and the authors reckoned that the benefits of alpha-linolenic acid were outweighed by the harm of erucic acid, while another study found that mustard oil had a protective effect, and the authors reckoned that the benefits of alpha-linolenic acid outweighed the harm of erucic acid. The use of mustard oils in traditional societies for infant massage has been identified by one study as risking damaging skin integrity and permeability. Other studies over larger samples have shown that massaging with mustard oil improved the weight, length, and midarm and midleg circumferences as compared to infants without massage, although sesame oil is a better candidate for this than mustard oil. The pungency of the condiment mustard results when ground mustard seeds are mixed with water, vinegar, or other liquid (or even when chewed). Under these conditions, a chemical reaction between the enzyme myrosinase and a glucosinolate known as sinigrin from the seeds of black mustard (Brassica nigra) or brown Indian mustard (Brassica juncea) produces allyl isothiocyanate. By distillation one can produce a very sharp-tasting essential oil, sometimes called volatile oil of mustard, containing more than 92% allyl isothiocyanate. The pungency of allyl isothiocyanate is due to the activation of the TRPA1 ion channel in sensory neurons. White mustard (Brassica hirta) does not yield allyl isothiocyanate, but a different and milder isothiocyanate. Allyl isothiocyanate serves the plant as a defense against herbivores. Since it is harmful to the plant itself, it is stored in the harmless form of a glucosinolate, separate from the myrosinase enzyme. Once the herbivore chews the plant, the noxious allyl isothiocyanate is produced. Allyl isothiocyanate is also responsible for the pungent taste of horseradish and wasabi. It can be produced synthetically, sometimes known as synthetic mustard oil. Because of the contained allyl isothiocyanate, this type of mustard oil is toxic and irritates the skin and mucous membranes. In very small amounts, it is often used by the food industry for flavoring. In northern Italy, for instance, it is used in the fruit condiment called mostarda. It is also used to repel cats and dogs. It will also denature alcohol, making it unfit for human consumption, thus avoiding the taxes collected on alcoholic beverages. It is poured on both sides of the threshold when someone important comes home for the first time (e.g. a newly-wedded couple or a son or daughter when returning after a long absence, or succeeding in exams or an election. Used as traditional jaggo pot fuel in Punjabi, Bengali and many other weddings in different part of India. Used as part of home-made cosmetics during mayian. Used as fuel for lighting earthen lamps (diyas) on festive occasions such as Diwali. Used in instruments. The residue cake from the mustard oil pressing is mixed with sand, mustard oil and (sometimes) tar. The resulting sticky mixture is then smeared on the inside of Dholak and Dholki membranes to add weight (from underneath) to the bass membrane. This enables the typical Indian drum glissando sound, created by rubbing the heel of the hand over it. This is also known as a (Tel masala) Dholak Masala or oil syahi. ↑ Rastogi T, Reddy KS, Vaz M, et al. (April 2004). "Diet and risk of ischemic heart disease in India". Am. J. Clin. Nutr. 79 (4): 582–92. PMID 15051601. ↑ "Mustard". A Guide to Medicinal and Aromatic Plants. Center for New Crops and Plant Products, Purdue University. Retrieved 3 January 2009. ↑ "Mustard Oil, Synthetic". JT Baker. Retrieved 3 March 2010. Effect of an Indo-Mediterranean diet on progression of coronary artery disease in high risk patients (Indo-Mediterranean Diet Heart Study) a randomised single-blind trial. Tanuja Rastogi; Reddy, KS; Vaz, M; Spiegelman, D; Prabhakaran, D; Willett, WC; Stampfer, MJ; Ascherio, A (2004). "Diet and risk of ischemic heart disease in India". American Journal of Clinical Nutrition. 79 (4): 582–592. PMID 15051601.